In writing Essay 165 I wondered what a size 12 dress size is. Wife No1 was occasionally a 12 but sometimes a 16 (with no change of her real size) while No1 wife (who is also wife No2) is usually a 4 but in practice anything from 2 to 8. As a believer in our ability to measure things, I am very confused. Conversions between dress sizes for women can be found here. Based on that source, a UK 12 is the same as a US 10, medium, European 40 Italian 46, Australian 16 and Japanese 15. Call this  So quite a lot of confusion can be generated if the sizing shown is not indicated as ‘UK’. An Australian 12 is a UK 8 and an American 12 is a UK 14. There is a standard (see), which for women’s clothing would be ISO 4416 and perhaps EN 13402-3. A size 12 is intended to fit a 38-30-41 woman [I don’t think it is so at all]. SizeGuide says differently; The British sizes are also used in Australia and New Zealand. The French sizes are also used in Belgium, Spain and Portugal. The German sizes are also used in Austria, Netherlands, Switzerland, Sweden, Denmark and Norway. Looking still at a UK 12, this now is the same as a US 8, large, German 40 (the same), Italian 48, Australian 14 and Japanese 17. Call this . That makes Australians far more confused, while Germans and Brits agree what the size is – or seem to, until importing clothes. I found some help at unit-conversion but this was slower to read – I imagine most users would want to see a table. Here a UK 12 is the same as a US 10 (but an 8 in suits/dresses), medium, German 38 French 40 , Italian 44, Australian 14 and Japanese 13. call this . That disagrees sufficiently with the earlier comparisons to render all conversion tools useless. UK 12 is US 10, medium, European 40, Italian 46, Australian 16 and Japanese 15. UK 12 is US 10, medium, German 38 French 40, Italian 44, Australian 14 and Japanese 13. MBB UK 12 is US 10, medium, German 40 French 42, Italian 46, and Japanese 13. Among the comments made in metricviews, was the absence of proper measurement must be costing the industry a fortune in wasted delivery and returns because the customer can’t be sure of a proper fit. So the 1951 woman was smaller all over, but noticeably so at the waist & hips; indeed, the average 2012 woman is more pear-shaped. Of course the distribution, the thing of more interest than a single statistic, is missing. I have shared what I found. The survey points to body scanning as a technique we may see developed. A large number of measurements are taken, reduced to maybe 130 key indicators. I can see a future where you pick which style you want, perhaps go play with real clothes to see if it is what you want, and then the exact-size garment is made and shipped. That still leaves huge scope for mind-changing, which would be the very thing the service would be trying to stop; maybe there would be a critical point beyond which refund would not be 100%; perhaps you’d buy into the service which would then provide funds for the difficult customer. It leaves available design issues (“This is supposed to be loose there, but tight there”). Ideally you simply have on file your size and the shop would deliver to you what is intended for that size. Maybe you use you 3-d printer to produce the garment in a limited range of materials – if that could be recycled through to the printer you might even have a fitting at home. Potentially that would save a load of hassle, but perhaps would remove the ‘fun’ in buying, separating the therapy from the retail. I don’t think so, since we’re able already to have images of ‘you’ dressed in ‘that’ on our screens. What is left to show is how it looks in motion, hanging on you in your normal stance – quite enough to persuade one into changes of habits. Or, as in my case, simply not to look in mirrors. Not that I often admit to wearing dresses, you understand…. What would be sensible would be to conform with EN 13402, the European standard for clothing size standardisation. I note that the ISOs are not available to read except by purchase. Wikipedia shares a good deal of the EN standard, linked above. Of course that doesn’t tell us what a UK 12 should be, It tells us how to declare an article of clothing within the EU (wrong: EU is not the same as the European Committee on Standardisation, the author of EN 13402) framework. • since internet purchasing easily crosses national boundaries, the buyer also needs measurements to be understood and ideally standardised. • We need (we think we need( a short code, a minimum number of representative measurements, to establish a decent ‘fit’. The hope for better labelling, which may as I wrote above be circumvented by imaging, lies within EN 13402–4, which defines a 5-character coding system. Read 13402-1. Measure the girth of: the head, neck, chest bust & under-bust, waist, hip; then some lengths: height, inside leg, arm, hand, foot; and measure body mass. Secondary measurements basically relate those primary measurements to clothes, though a tailor would measure several intermediate lengths and allow for shape and stance. The next step allows garment manufacturers to move to stepped functions, by indicating a range for a designed (built) garment. Step sizes seem to be in 4cm units. So in trousers, what is recommended is sizes labelled 156, 160, 164 etc (4cm steps) which means that each trouser is size±2cm, ie, 160 means 158-162. Similarly in chest sizes, 84, 88, 92 etc. Where full height is the reference, then the steps are in double units, 160, 168, 176 etc. So note that the step is 4cm and the unit is an integer multiple of the step. For bras (guys, a more difficult purchase than you might think), standard sizes are multiples of 5cm with a ±2cm range (what a guy thinks of as chest size) and then cup size is an expression of the bust difference, odd numbers ±1cm [AA 11±1, A 13, B 15,... F23, G25 etc). Eg a 80B fits a woman of under-bust girth 78-82 and bust girth of 94-96cm. According to the rules in 13402, anyway. Continuing with the 13402 standardised sizing system we then have defined the XS-XXXL system, starting at a chest size 74±4 for men at XS and running on in 8cm steps to XL at 114±4. (XXL is 123.5±5.5 and XXXL at 135±6 are different for unexplained reasons perhaps to do with the population distribution; 3XL should (to be consistent) be for 130-142cm chests). For the ladies XS is 70±4 at bust girth, we step in 8cm units so that L is 102±4 and then XL onwards are on 113±6, 125±6, 137±6. Sadly, the ideas in 13402-4 have successfully been depressed by two events. In the first case, Which? magazine misread the European Standards Commission as being the same as the EU (the state) so that, second, when the British press (the enemy) read this, they chose to represent the suggestion (think White Paper) as yet again Europe imposing a new set of rules upon us. Like sheep we did not question and the whole thing was abandoned. Meanwhile we continue to need a comprehensive system of measurement. Of course, I blame the Press for this failure. It need not be difficult. Just using any measurement exactly would help (e.g. if it is called 74, to fit 74±4, then that is what it does). For clothes that exclude head, hand and foot, we need only ten measurements including height and weight. If we knew the order and counted which increment we were in, we could then describe someone pretty completely in just ten characters, or include hats & gloves in 13 characters, suggesting we might squeeze this down to a 16-character, perhaps 20. With packing, we might squeeze that down further. EN1402-4 says we can write all the primary and secondary measures from 13402-2 in 12 digits. From that we could write all the in-use combinations and give a short 3 digit code (and maybe only 2 digits). The 2005 proposals were dumped, to general surprise and possibly as a consequence of press coverage, but there was a limited agreement made in 2006. The consensus was held that the primary dimension should be visible (say height) and a character or two for some other dimension, much as for bra sizes. e.g. 100BG might be a jacket for bust/chest girth 100cm, hips group B (104cm) and height group G (176cm)1. Oh, and the new standard includes a pictogram for the hard-of-reading. Sadly the 2006 agreement was subsequently rescinded and we’re back to the previous state of garble. Wikipedia points to a short paper by Monika Boguslawska-Baczek (in clear, readable English; I’ll call her MBB). There is little evidence of research into the national shape and how it changes. The UK is better than most, and our work is largely sponsored by a group of clothing companies (including John Lewis and Monsoon) who clearly see the point in knowing the shape of their market. 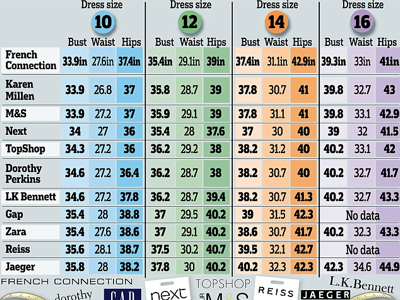 Nations do have tables of clothing sizes as industrial standards, (see MBB, footnote 13). The evidence I found earlier shows that this is a changing scene and that therefore the measurements need to continue so as to allow providers to fit their market. However, as MBB writes, the probability of a declared size actually being that size or fitting someone of the declared size is low (now there’s a Stats project on offer). Body shape is different across nations and so the descriptors are often unhelpful. Thus women know what size they are for a particular shop and they discover which shops ‘have my size’. Disappointingly, some shops are not even internally consistent – they are instead infernally inconsistent. So I shall continue to take a book to read when we go shopping. top pic from the Daily Mail. Just because there’s a standard doesn’t mean anyone will follow it. Historically it was a mess such as this that caused the creation of the yard, foot and inch. And, because the French couldn’t possibly agree to something British, the metre shortly afterward. It is in their nature, you know. http://en.wikipedia.org/wiki/EN_13402 entered twice here because this is the location of the support files from various other bodies. MB-B’s research says a UK 12 is the same as a US 10, medium, German 40, French 42 , Italian 46, and Japanese 13. That differs from the other sources, but at least she identifies where she got her data. would bear (in addition to the explanatory pictogram) the compact size code “100BG" . This proposal was agreed upon in a March 2006 meeting in Florence and a final draft was produced by AEDT on 6 June 2006 . All of this is utterly screwed up by Brexit, 20160624. Or maybe not; the need for alignment is unchanged. We could sort the UK scene out properly, and then (choose to) follow whatever EU regulation is in force. However, I suspect that uk.gov will never lead in the formation of regulation, preferring to leave it to ‘market forces’, meaning to leave it to the industry itself to create any standards. The point of having a national standard is that we all follow it; I see a need for a suitable adjective to indicate the difference between, say, a recommended standard measure and a nationally mandated regulatory measure. One of the persistent complaints about the EU (leading to Brexit, we are told) was the interfering, expensive-to-comply-with regulation. But then, if that means we have unregulated measures, who is the loser, really? While mail-order clothing companies are reporting a 30% return rate (source needed other than memory of the radio) those same companies are fighting an uphill battle where they surely have a serious need to correct perceptions of what a ‘right’ size is. I can see that learning that, say, you’re a “Monsoon size 12” and that this fits your shape means that you happily go to Monsoon to see what they have, knowing that it will fit you (believing, anyway) even if it won’t suit too; this is customer loyalty purchased. Maybe that outweighs (or is thought to outweigh) the numbers that drift in and out, trying things on and never finding a ‘fit’? I observe to the boss that <shop> has never yet produced a ‘fit’, so therefore it should be crossed off the shopping trail (she leads, I trail, book in hand). To my surprise, this has been accepted as evident and as evidence, so that now the test, should we enter a ‘no fit’ shop, is whether that observed situation continues: which means we don’t have to fuss whether ‘suit’ occurs, because we’re testing for change of ‘fit’; if that fit were to have changed, the ‘suit’ becomes an issue and she becomes a potential customer.